In order to make NM State home football games better for the whole family, season tickets for kids 12 and under will be just $50 for virtually any seat in the stadium. Only seats in sections G and GG are excluded from this special price. In addition, game day tickets for kids 12 and under will be just $5 in general admission or east side seats. 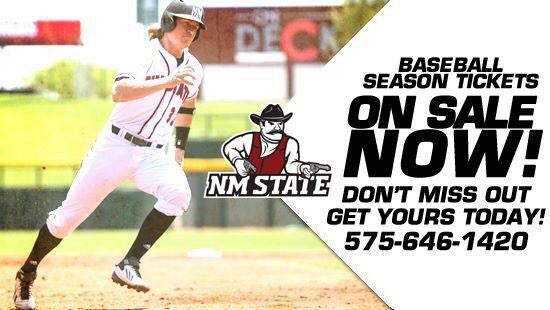 As in past seasons, NM State athletics will also be partnering with local youth organizations, military bases and charitable organizations to provide season tickets and single-game tickets to select games throughout the season. The 2014 NM State football home schedule includes non-conference opponents Cal Poly on Thursday, August 28 and I-25 rival New Mexico on Saturday, Sept. 20. In addition, NM State heads to the Sun Belt Conference after one year as an independent and will welcome four conference mates to Las Cruces: Georgia Southern, Texas State, Louisiana-Lafayette and Louisiana-Monroe. The new conference is one of many new things to come to the football program this year. A new synthetic field will be installed, meaning that the field will look great and play consistently all season long. Construction on this important recruiting and community tool will begin in May. The Aggies also welcome veteran defensive coordinator Larry Coyer, who takes over the reins of a young defensive unit. Fan favorite events will also be part of the 2014 home football campaign, as Ag Day will be on Aug. 28, Tough Enough to Wear Pink will be played on Oct. 4, Military Appreciation will happen Nov. 1, and Homecoming will welcome back alums on Nov. 8. Groups of 20 or more can order single-game tickets at a reduced rate. Ticket orders will be filled in the order they are received. Season tickets go on sale May 26 and can be purchased at the Pan American Center ticket office or by calling 575-646-1420.